I hope everyone had a great Easter if you celebrate it! I had zero time to do any of the things I wanted to get done including a failed Easter mani which will never see the light of day -_- When I say it was a fail I mean it was epic. The mani I created afterwards though...dead brill but will leave that for another post shall we? 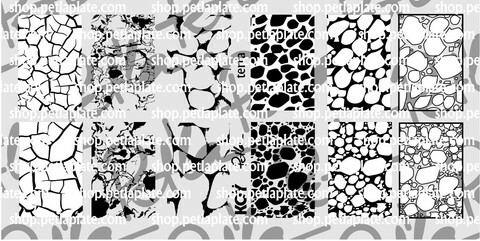 Today let's talk about the latest release from Pet'la Plate for the Spring. I think these plates may have released about 1.5 months ago maybe. It's hard to say since even the Pet'la FB didn't have an announcement posted for the new release. This is Bonnie's wishes. It's obviously a pet lovers inspired plate. I'm honestly not entirely sure what to think of this one. 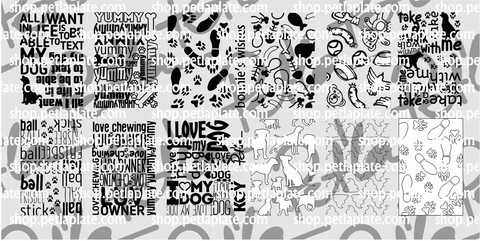 It feels really jumbled and I think that's in part because of the protective watermarking and in part because of how the images kind of jumble around with footprints, text, fishbones, etc. I hate to say it but this plate is not one I'm in love with. The piles of poo....ugh I would never ever want that on my nails. Sorry! Ah that's better trusted abstracts, curls, and waves. How appropriate that this plate then be named Curls. 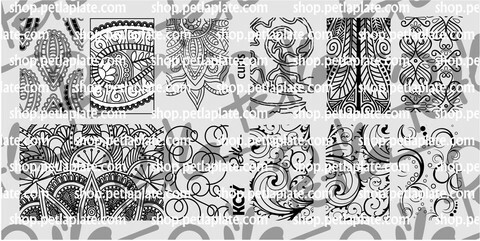 I'm gong to say this isn't the most innovative plate simply because I've seen similar patterns to the one one in the lower left hand corner before. But I like a good abstract plus I really love these images on the bottom row on the righthand side - the last 3. Happiness. Is plaid, feathers (agree), more feathers (agrees), squiggles and various geometrics. Hmmm even though I'm not totally blown away by this plate I love these feathers to death and I find myself oddly drawn to the squiggles and nested geometrics. It's not a total sale, but it's definitely one the wishlist. For me this plate is just about average. 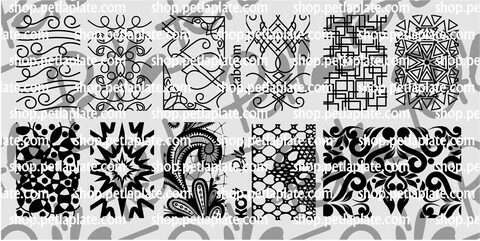 Except for the image bottom row 3rd and 4th from the left every other image I'e seen on other plates before across multiple brands. It's probably because they are somewhat classic images, but for me they aren't very exciting. Im trying very hard these days not to buy plates for 1 or 2 images and part of the problem is I really love this company. I'd say if you don't have any of these images in your collection this is one of the more solid and beautiful plates in this collection. This is definitely inspired by the Doodles clusters but this is the first time I've ever seen them done this way. 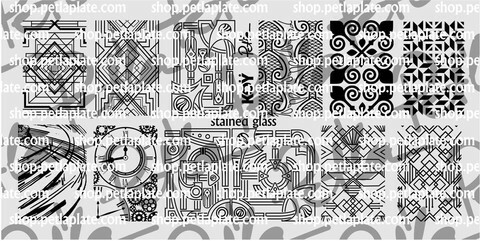 The lines and geometrics seem very simple, but I bet if you picked up images in the middle of three patterns it would make an amazing stamp. By far this plate is definitely the best one in the entire spring collection and I love the complexity here! Classic geometrics. Both images in the lower lefthand corner ad gorgeous. I'm not totally in love only because I have some similar images across 2 other brands, but for me this one definitely has a enough unique images - center bottom row and center top to warrant addition to the wishlist. Terra. I think these are supposed to be images of land plots i.e. terra. To me they look a tiny bit like animal print or splotches. 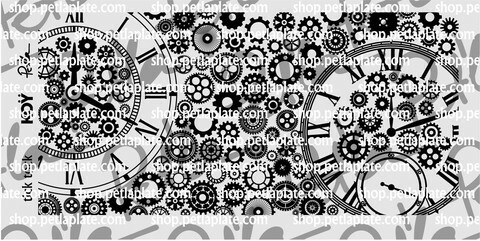 This plate also feels really repetitive across the images which is strange. I think its because of the cluster of reverse mirror images. What do you think of the collection? For myself overall this is kind of a hit or miss collection for me. I'm not sure why, but I'm not really in love with any of the plates here though several feature images which I LOVE. I think its a very solid collection and so that may be the problem. I love solid collections because that is how I built such an expansive collection of plates, but at the same time I do tend toward plates now that give me a thrill. I want to see images that I don't own or that really stretch or push the conventions of what is out there. However everyone has to start somewhere and there are a lot of beautiful abstracts and images above. 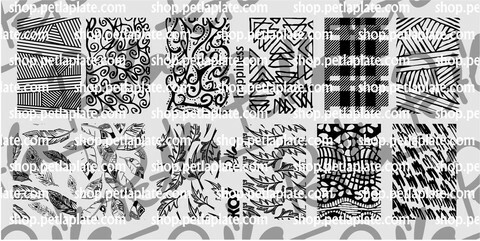 One thing I can say about Pet'la is that the quality and the beauty, like literal beauty of her plates, is excellent so you won't reget purchasing. 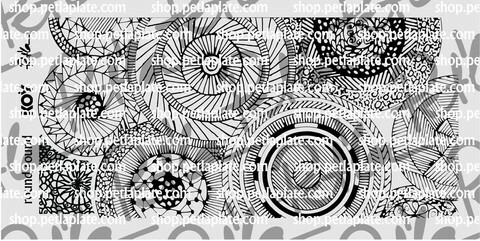 These plates retail for 8 Euros each + shipping and are already available for order on the Petla Plate website. Happy hunting and I'll see you next post!